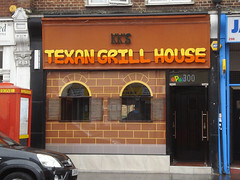 Tex-Mex restaurant on the High Street. It opened in late 2014. It also does takeaway and delivery, with online ordering via Deliveroo. The premises were previously occupied by a hair and beauty salon called Classic Parlour photo. Classic Parlour opened some time around spring 2012, but had closed by March 2013. By July 2013 it was a halal pizza place called Frenzy photo, but this closed some time between April and November 2014. See photos of takeaway menu from some time in 2013: 1, 2. Existence last checked in May 2016. Last edited 2019-02-11 13:16:20 (version 37; diff). List all versions. Page last edited 2019-02-11 13:16:20 (version 37).